Since Luke arrived, I've been spending a lot more time at home. Between the heat, the baby's schedule, and just finding new rhythms, it's often easier to be at home. As a homebody, most days I don't mind. Although, honestly, I'm looking forward to cooler temps + a fresh fall schedule because I do have days when I get a little squirrelly, and the fall equals more time out and about. 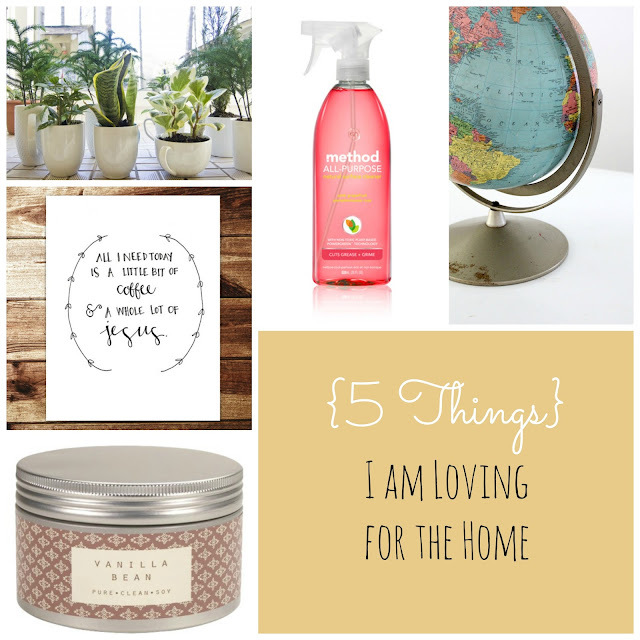 But, since I am currently spending most of my days in our little home, I have (and am also eyeing) a few simple things that bring warmth and enjoyment to our home. 2. Adorable Print from Evan Nicole Designs. I think this one would look adorable above our coffee maker or next to the much-loved coffee bean jar. 3. Vanilla Bean candle. I picked this up at Target a few weeks ago (one of those little splurges), and I love it! Sometimes, when I need a little motivation to clean my kitchen, I bribe myself with "when your kitchen is clean, you can light that candle." Guess what? I usually get my kitchen clean! 4. Method's All-purpose Cleaner (grapefruit scent). This little gem also caught my eye during a Target trip (what can I say? I love Target! ), and I sometimes find myself wanting to clean something just to have my home smelling like this. Even though I love a good DIY all-purpose cleaner, sometimes it's nice to have something ready to spray (especially if the little one is stirring from a nap!). Plus, it's non-toxic, so that gives it brownie points! 5. Vintage globes. Since a move will likely come when Josh graduates from school in December, I am trying to avoid buying house stuff (aka stuff that we'll probably sell in a garage sale), but I couldn't pass up a globe I saw at a local thrift store. Even when we do move, my globes are sticking with me! What things are you loving for your home lately? Isn't it funny how it's the little things are often what you enjoy most?